The book is my Ph.D. dissertation written under the supervision and guidance of Dr. P. B.Vidyarthi, Prof. of Philosophy, Ranchi University. I too, had worked my D. Lit. with him on the topic concept of person! It is always a joy to be with him and understand philosophy. It is a rare chance for a scholar. Both the works are Vedanta. 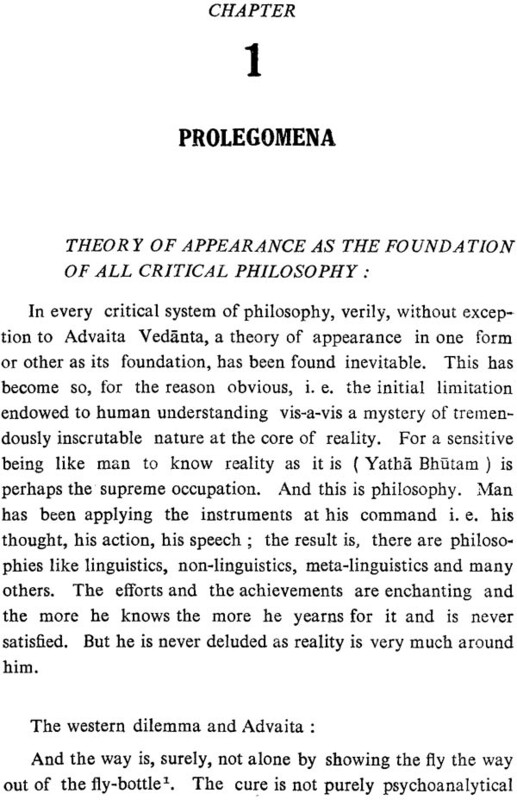 As everybody knows no philosophy of the world has opened such wide vista to a philosophic seeker as Vedanta. With regard to important questions like ‘world’ and man’s ultimate destiny Shankara’s analysis, in particular, has brought revolution. My aim is to understand Shankara in the bosom of modern thought to see what clue Vedanta Philosophy of India can provide to explain and understand the riddle of life and existence. 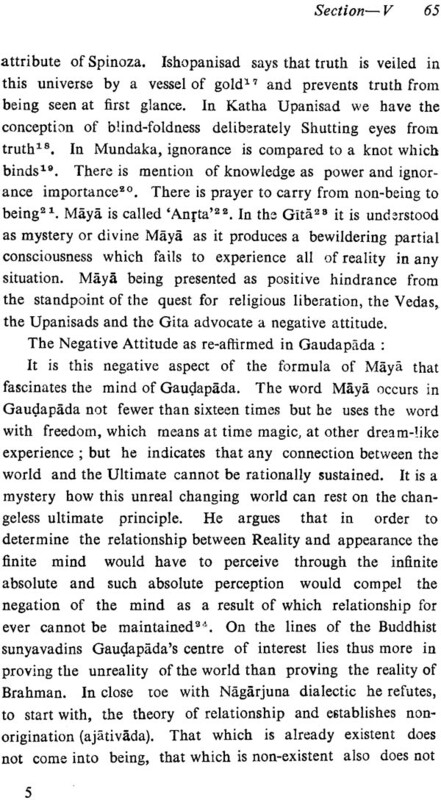 Advaitic conclusion of the world as Maya and reality as Brahman are a few positive approaches to the question. I dedicate the work to my parents; my father, a voracious reader, always a book in hand, who is no more and my mother, a brave woman. I remember too, at this occasion my teachers, especially my beacon guide into the philosophic arena Prof. Shyama Kumar Chattopadhyay P.R.S., Prof. of Philosophy, Ravenshaw College, Cuttack. May I not speak about my wife who sacrificed all her comforts that I move freely in the philosophy wonder land. Tume O’ Mu (Thou and ‘I’) in Oriya. “An introduction to philosophy of upanisad” is going to press. Sometimes lecturer in English at present he is Reader and Head, Post-Graduate Deptt. Of Philosophy, Gangadhar Meher College, Sambalpur (Orissa). Earned recognition among men of achievement of Asia 1992. The thesis entitled 'The Doctrine of Maya in Advaita Vedanta' is a modern appraisal of the concept which proposes a rehabilitation of the Advaitic conception of the world in the context of modern knowledg. And, in the process, it seeks to establish that no other explanation of the world except that of the Advaita could be convincing, rational and cogent and if other explanations are there, they are just different names of which the Advaita constitutes the nucleus. 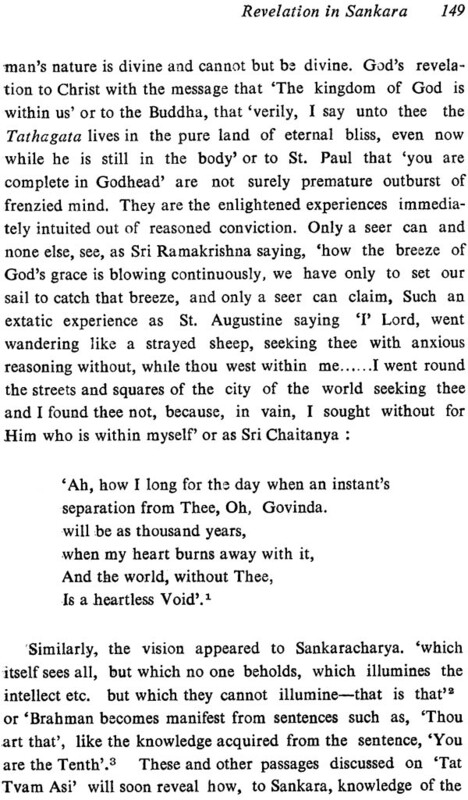 And, as a matter of fact, nowhere has the invitation to human quest for reality been as irresistible, true, rational, illuminating and experimental as in Advaita Vedanta. Therefore, it is no wonder that contemporary science in its epochal adventure of inquiry from relativity to unity finds its foundation of inspiration in Advaita itself. Maya constitutes the pivot of Advaita Vedanta. As every student of the advaita philosophy knows, maya comes in the explanation how the many (world pluralities) issues forth from the one without this one losing its oneness and identity. It is to be the metaphysical explanation of the world, we know. My point, which I like to drive home here is, the modern scientific explanation of the Universe on the lines of Relativity Physics and Indeterminability (Hiesenberg) does not materially differ from the Advaita explanation. So, even as a descriptive knowledge the doctrine of Maya need not be taken as absolutely wayward since it bears out the conclusion of modern physics, although as knowledge intuitive it goes beyond it. In this second aspect it is self-knowledge, knowledge of the identity of the many with the one, identity of ‘I’ with 'That'. Science does not give it. 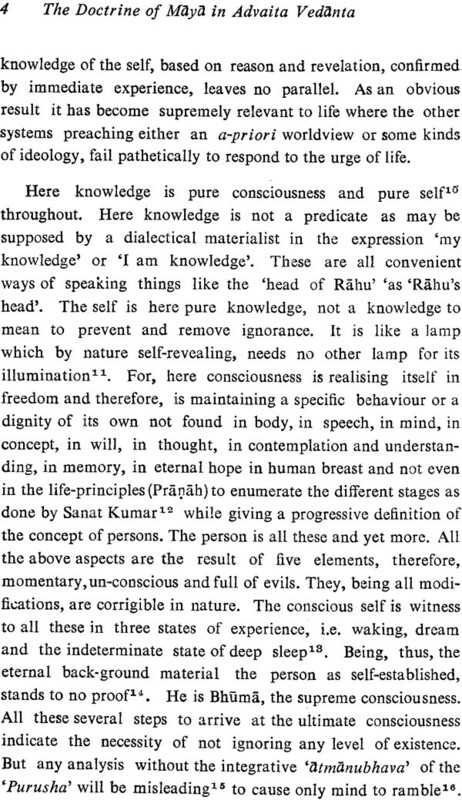 Such knowledge is for the Vedantic practice- leading to self-realisation, But as far as the explanation of the multiplicities in terms of the indeterminable one-that is tracing the many to the one is concerned, the parity of the two explanations, the metaphysical and the modern scientific is remarkable. 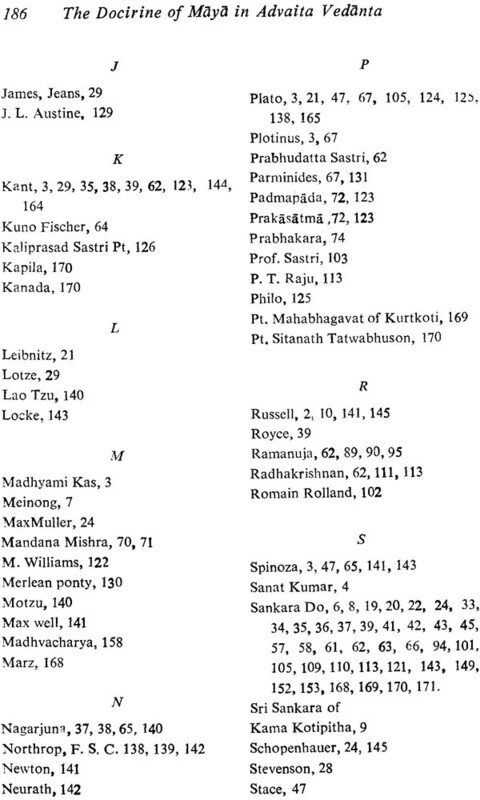 A descriptive analysis of the Vedantic cosmology jyotirbrahma, the cosmic energy, Sabdabrahma, mahakasha, the all-expanding plenum individuating relentlessly in nama and rupa and absorbing the 'nama rupa' again in its indeterminable vortex and again throwing them out-this is not very remote from the scientific explanation of the world by modern physics. Therefore, the Vedantic world as Maya as neither real nor un-real need not be taken as nothing, but a something that is really indeterminable by means of any intellectual category. So my' movement is against any form of illusionism or pure Ramanuja. I have tried in my humble way to substantiate this stand by an appeal to the revolutionary yet revealing findings of the quantum field concept, theory of relativity, depth psychology and the post-Darwinian evolutionism which having exploded fully the dogmas of 19th century idealisation together with the cold logical belief that limit of matter is the limit of the world converge on the desideratum built by the Advaita Vedanta. I, too, have felt it no less compelling to point to the predicament of the philosophical analysis with its methodological dogma echoing, as it does, the 19th century slogan, that the limit of language is the limit of the world, and yet I have sought to discover from under such linguistic and conceptual camouflage the quiet yet serene voices of the indeterminable pointing to a positive self as the source and the sustainer whichhas not deluded the searching ear. The existence of the faculty of speech without Purusa is an age-old fallacy, incomprehensible and incongruous. 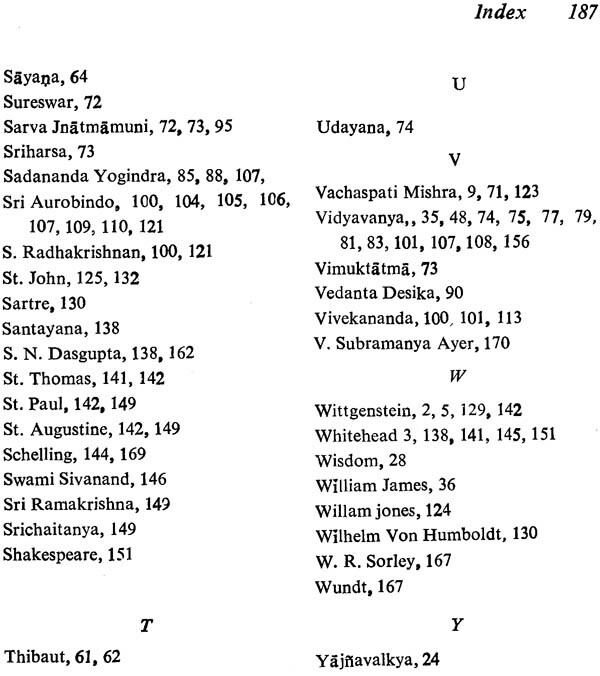 The emergence of the speech with the junction of Prana and Apana and its dissolution in the mind at the time of death and the dissolution of all again in Brahman as understood and analysed in Chandogya Upanisad in its characteristic metaphorical elegance like, Puruso agnih tasya vagava samit, is a strong testimony to the finding that any concept or word cannot but have the element of reference in purusa who brightens it and shines by it. 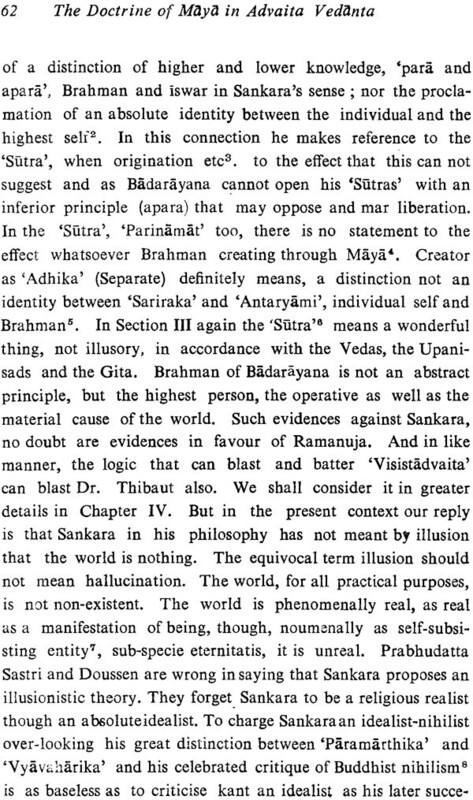 In its positive aspect the call of Advaita to look to the true nature of Reality (Yathabhutam), and in its negative aspect to bring to realisation the fact that man's misgivings about life, his so called life of ruin and impoverishment in the context of the struggle for existence are Maya and unreal; and that life is not poor, dismal and false, works out, perhaps, the greatest philosophy of life ever conceived and propounded. Advaita has another singular uniqueness. 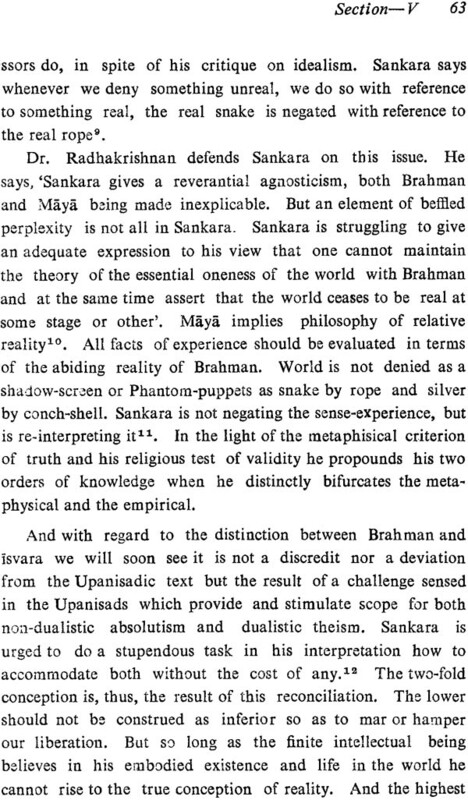 On its epistemological side it does not seek to chase to blind alley and whisk to mere logical see- saw, but as a 'Darsana' derived from the Sanskrit drs, means to see or vision, points to the greatest fact that man's salvation lies in knowledge that passes through language and concept till its leads to a deeper realisation signified by them, in the self, the knower. Here knowledge and knower are identical. Nothing is dubious and nothing is deceptive. The analysts of the west stand askance facing a poorer world as they fail to acquire that height of 'sadhana' as a result produce nihilistic or sceptical philosophies. Their fate is like that of blind man led by other blind man (andhenaiva niyamana yathandhah ), And we are yet to come across a Synthetic system of philosophy in the West which enkindles a world-view and sets to motion the various dimensions of human inquisitiveness i. e. logical, psychological, linguistic, ethical. scientific, metaphysical, religious and spiritual. They emphasise one at the cost of the other, while some in their demagogical zeal committed to barren logomachy and hollow methodology failing to stimulate any value, others are contented in constructing dogmas. The whole predicament is that they are born out of chaos to lead to chaos. This is fundamentally so because they lack any urgency of purpose and direction. At times their originality is doubtful. They pick up some philosophical paradigms of the East and seek to build a system which naturally lacks conviction. 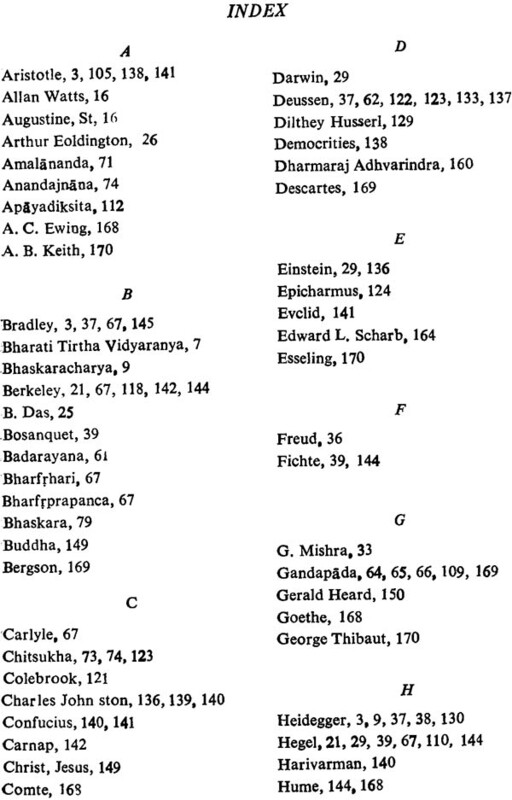 For example, wittgenstein's therapeutic school and the philosophy of the grammarians of the west are based on the negative aspect of the Advaita metaphysics and the Nyaya logic respectively, as Buddhism finds an unqualified echo in the philosophical movement from Hume till the day of Russell. The proceedings of the philosophy of Analysis in its descending or ascending order i. e. to start off by looking at metaphysical problems and end up with a look at language in every-day use, or take a journey the other way round relying on a grammar of vision, and innate faculte de language and postulate universals, as two modern philosophical spokesmen of the west like Ludwing wittgenstein and Noam Chomsky achieve respectively, sound to me as mere lingquistic representations of the metaphysical performance made by the Advaitins in their effort to relate names and forms (Nama Rupa) to the metaphysical Reality called Brahman through which, to understand figuratively, the latter speaks, thinks and communicates. Human experience is contemporaneous. And the sight of light is ever more compelling. Philosophy of Analysis in its attempt at framing concepts and spacing them into any logical map about all that can be known suffers most deadly shipwreck in the face of the fact of man's fundamental intuition, the self (the eternal centre and common witness to all objective reference, the present, past and future.) But the failure is luminously significant which, instead of explaining away the fact reestablishes what it leaves untouched and unattended. The silence here is more vociferous. 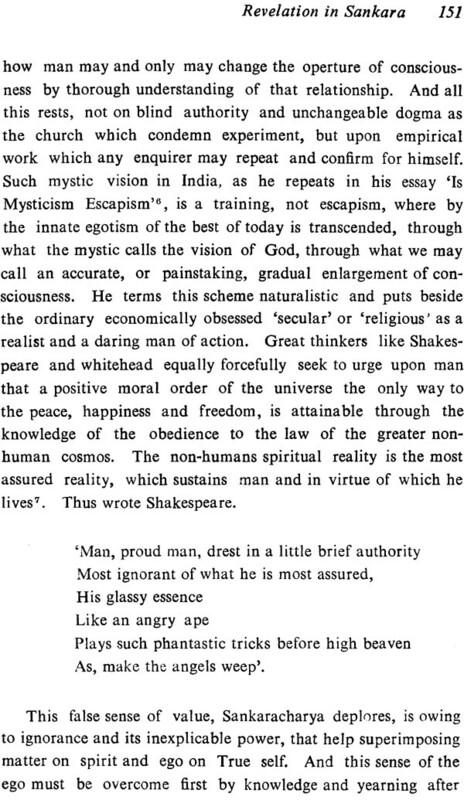 The helplessness and discomfort of modern empiricism in its battle against the bewitchment of intellect by means of language and with its method of uses-qua- use, in face of an autonomous referent, has established but the limit and inefficacy of language and has justified nothing less than the illusoriness of the world-as-limited-to-their-language. My aim, therefore, has been, through-out to' point to this subterranean rhythm of the modern trends of philosophy and scientific research to clinch the issue that what has been told in the Advaita philosophy has been but retold in them. In chapter one, the 'prolegomena'. I seek to draw attention to this fundamental position. I emphasise, to begin with, that a theory of apprearance can not but he inevitable and irrefutable. 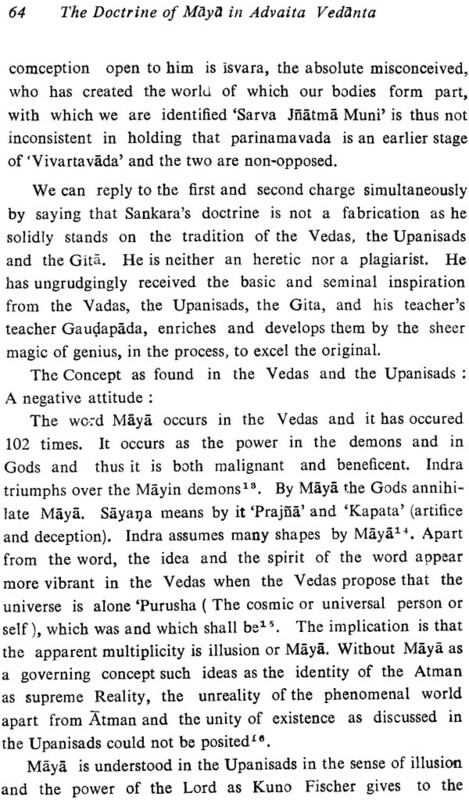 It has further to show the extraodinary moral meaning behind all doctrines of appearance as found in the Vedas, the Upanisads and in Gaudapada that as the manifest character of 'what is'. appearance is an ontological fact and not a linguistic illusion. In chapter two 'The Problem', I thoroughly concentrate on examining the problem of Maya as a revolutionary concept, the status of plurality, its nature and object as envisaged and understood in Advaita texts. The Chapter, in this connection exposing as a matter of necessity the dogma and the poverty of view held by logical atomism and logical positivism, makes emphatic reference to the explosion of modern knowledge in its findings of quantum field concepts, theory of Relativity and depth psychology etc. which have led research into a knowledge of the 'immutable' reality which is conscious and one, where the grandiose, hectic, moving panorama of pluralities as mere passing configurations. have been reduced to be mere ghostly, a modification, a name, My point, thus, is not only to unfold the scientific basis of the philosophy of Advaita but also to show how the Advaitic theory of world and reality has influenced and guided the modern thinking. In Chapter three and four entitled' Reconstructions' I have sought to view the problem from the standpoint of the post- Sankarites as Maya an undoubted fact of experience gathers added momentum. This chapter in its second part has made a study of the doctrine rejuvenated to the need of the modern temperament visibly under the impact of the explosion of science and technology without of course, doing damage to the basic datum. Chapter five which is a study of language and reality drives the issue to its logical conclusion respecting what are gone before and what other discussions to follow in the ensuing chapters. 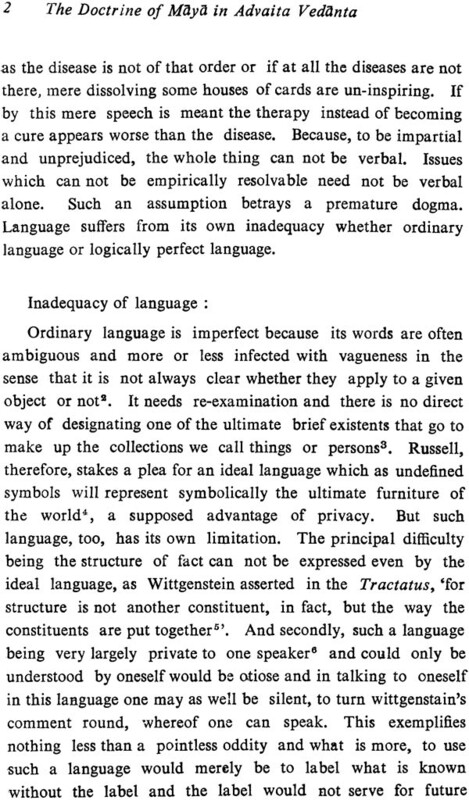 Here I insist on the necessity of the study of language not as an isolated study, a mere tool as done in the Philosophy of Analysis but language as the thought and speech of the Omniscient, Sabda as Brahman. 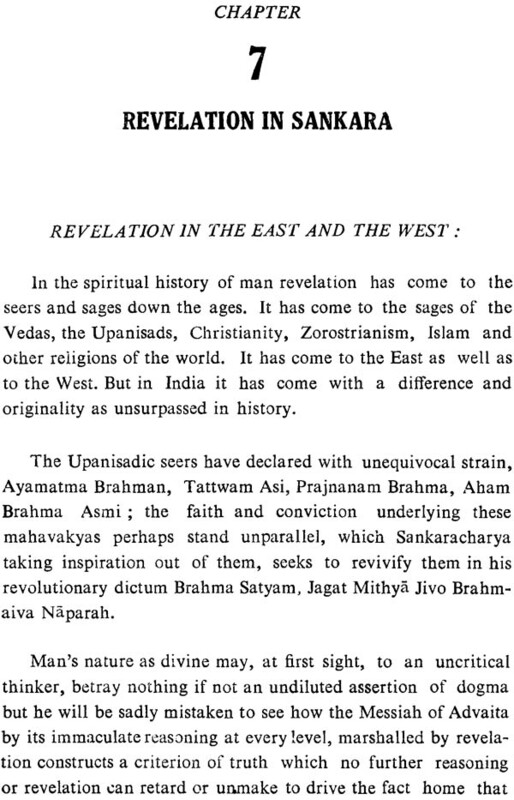 This emphasises what has been elaborately discussed in the Upanisads and the Brahmanas in their laudable hymns adoring Speech as a deity, the creative power and the medium through which Brahman seeks His revelation. 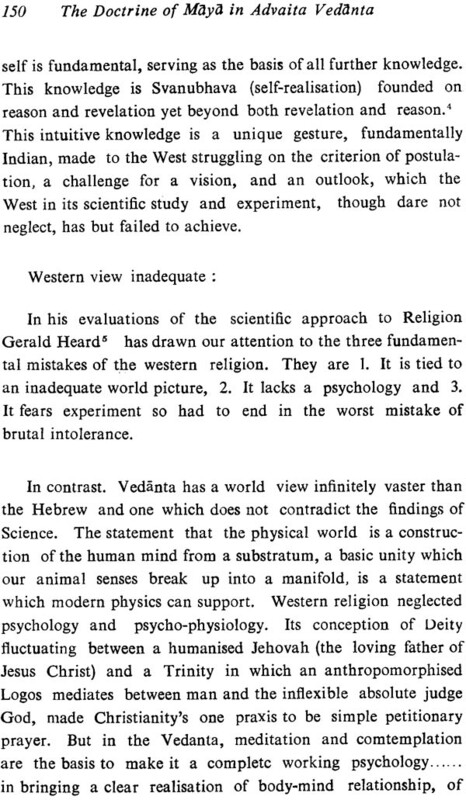 Chapter Six 'The problems for the West' after making a study of the concept of postulation and concept of intuition by showing their impact in the West and in the East seeks to make a claim for the intuitive basis of all knowledge. It has further to show how the western postulation bereft of an intuitive basis of self-knowledge which is the spirit of the East withdraws its claim from and betrays insensitivity to the study of reality as Incommensurate. Chapter Seven the 'Revelation in Sankara' seeks to hit the last nail. After a brief study of revelation as it has come to the seers of the East and the West it has made a study of the Mahavakya, 'Tattvam Asi' and has sought to pronounce that the self is all which is the transcendental consciousness and the only consciousness there is. This is not superseding logic nor a mysticism either. Self as the eternal centre of all reference to which all understanding is harmonised to be known is a fact that is meant in all cases. 'Tattvam asi' is no annihilation but realisation-no loss of the self but an infinite expansion of the self. This is known by the philosophical reason of Vedanta alone which no analysis whether grammatical or logical can supplant. The self is Brahman and Atman in one, without a Second, Vedanta declares Him as Satyam, Jnanam, Anantam,the source and sustainer of man's immortal hope, a claim which no country except India can hold out through its Advaitic spokesmen to regenerate manking. The Transcendental consciousness as the ultimate ground tolerates only an illusory other not a real 'other'. In conclusion I have sought to sum up all the earlier discussions to bring home my point that Advaita Vedanta has constructed the world's most rational and powerful philosophical system. 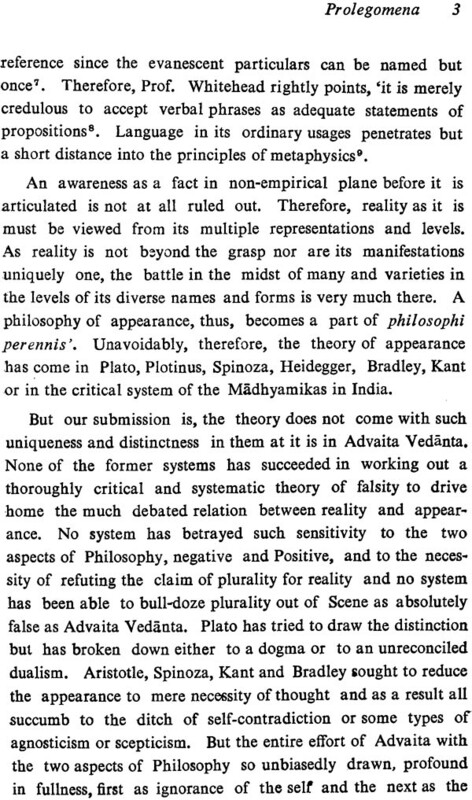 The claim is not phantastic for the reason that contemporary science has based its revolutionary ideas on the concepts of Advaita Vedanta. I, therefore, hate hoped that the concepts which have succeeded in bombarding the formidable ignorance from the twentieth century mind can be inwardised to bring man to know himself and save the modern man from the doom of his own making in a crisis-torn world. The whole work is an humble effort to focus attention to this direction of the study. And the personalities who have guided me to this track I adore among them Dr. P. B. Vidyarthi M. A. Ph. D. University Professor, of Philosophy, University of Ranchi, Professor R. S. Srivastava, the Head of the Department of Philosophy Ranchi University, Ranchi and professor S. K, Chattopadhyaya P. R. S., U. G. C. Professor in philosophy, Ravenshaw College, Cuttack.